June 20, 2010 by Alphageek in "alphageek bourbon elmer t lee"
Yet again, a picture of an empty bottle. I know what you are thinking and it is not good. I like this picture because you can see the person on the back of the bottle. Before you say "so what", go try to take that kind of picture yourself. This would not be my favorite bourbon. I found it to be rather harsh. As a result of the harshness, I found this worked well as a Manhattan, or some of it was used in cooking. I don't really think this makes the greatest sipping bourbon out there. However, that harshness melts away when used other ways, meaning that bad bourbon is still pretty good, so buy this if you like your bourbon other than on the rocks. 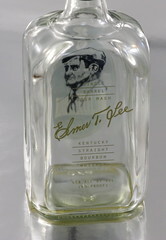 "alphageek bourbon elmer t lee"